Apple just wrapped up their Apple Watch and MacBook event a while ago and showed us some things that we liked and some that we didn’t. We were expecting to learn a lot more about the Apple Watch since its announcement in September but at the end of the day, the information left for us to absorb was really just the price range and release dates. Here is a look into the Apple Watch segment from the event. First off, you need to know that there are three different classes of the new wearable, the Apple Watch Sport, Apple Watch and Apple Watch Edition. All of them essentially represent different price brackets in the lineup. Additionally I must mention that there are two sizes of the wearable too for each class. There is a smaller (and cheaper) 38mm watch and a larger (and $50 more expensive) 42mm watch. The Sport is the cheapest entry into Apple’s wearable ecosystem. 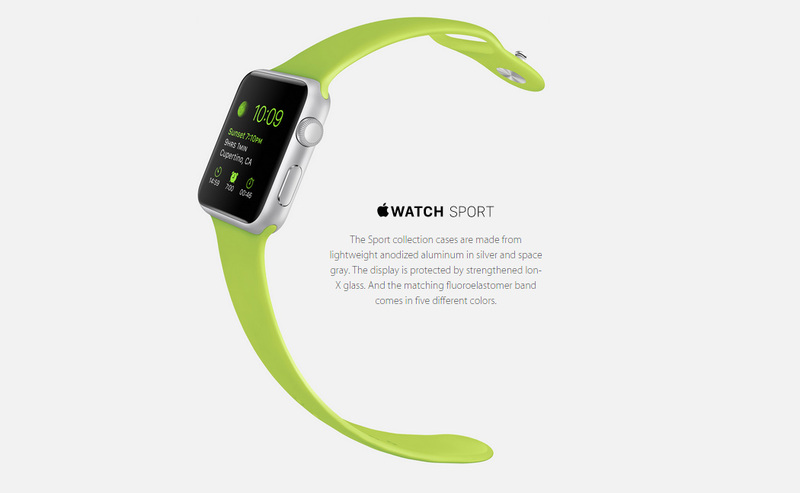 It features an anodised aluminum body (available in space gray and silver) with a plastic watchband available in a multitude of bright colours (lime green, blue, pink, white and black). It has an IPX7 water resistance rating meaning it should be safe to wear in a light drizzle and protect against sweat but don’t go bonkers and take it into the shower. The glass covering the screen is Ion-X-Glass which Apple says gives you adequate protection from scratches and what not. 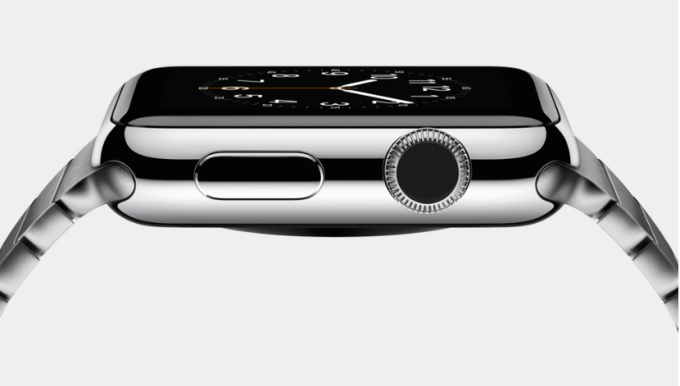 The 38mm version will cost $349 whilst the 42mm one will cost $399. The prices go up with different watch band configurations. The standard plastic sport band costs $49 so essentially the watch dial costs $300 and $349 respectively. The Apple Watch is the standard model that most people may be looking into. It comes in stainless steel with a “traditional finish” or in space black. The cover glass is made of sapphire crystal and the back is made of ceramic. This variant has the widest range of watch straps, coming with four leather band options coloured in blue, black, brown or “Stone”, each costing a whopping $149. The steel Milanese Loop also costs the same. For $249, you can get the Modern Buckle model which comes in blue, black, pink or brown. This model’s leather comes from a small French tannery and its buckle is made up of a two piece magnetic lock mechanism. And finally the stainless steel Link Bracelet that looks very nice will go on sale for only $449. Only. As for the watches themselves, the 38mm costs $549 and goes up to $1,049 whilst the 42mm costs $599 and goes up to $1,099. 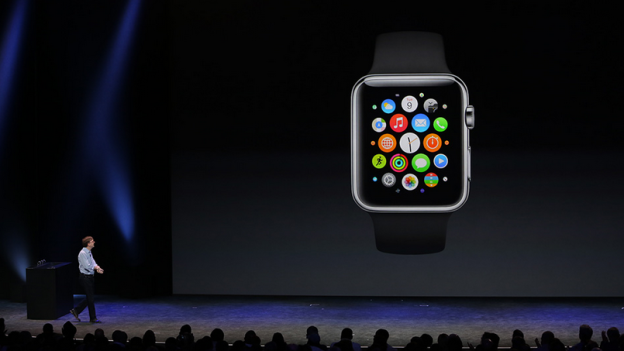 The Apple Watch Edition is “unbelievably unique and very special” according to Tim Cook. It is the most premium (and obviously most expensive) wearable offering and sports the most confusing name you could give a product. The back is ceramic and the body comes in an 18 karat yellow gold or rose gold editions. The glass protecting the display is again made of sapphire crystal. 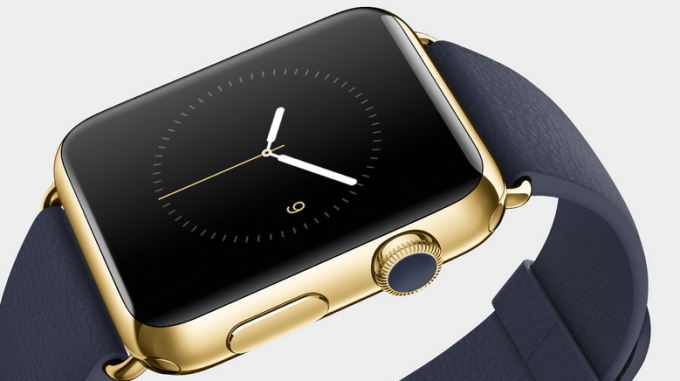 Aside from the gold used, it is identical to the Apple Watch. The bands that are on offer for it feature gold buckles and premium leather. While we do not know for certain the individual pricing for each Edition band, we know that the 38mm version starts at $10,000 and the 42mm version starts at $12,000 and goes up to – wait for it- $17,000. Aside from the materials used to make each version, all the watches are identical in physical dimensions and appearance and functionality. To sum things up, I could just say that the Apple Watch (and the Sport and Edition) do what EVERY other smartwatch does. It shows you your notifications, gives you control of your music from your wrist, tracks fitness stats and depends heavily on your smartphone. You can change watch faces to customise the look and that’s about it. Apple quite literally pulled a Samsung with the Apple Watches (we will add more detail later) and added the ability to take voice calls from the watch as well as read and respond to messages and notifications from some social media apps. All the watches have a heart rate sensor, GPS and NFC locked specifically for Apple Pay and other proprietary functions such as unlocking doors at select hotels. The Apple Watch also comes with Siri on board and does basic Siri things, nothing new really, although the animation when Siri is activated looks pretty cool. Apple is renowned for having the simplest, idiot proof interface in the market for its mobile devices. The same however cannot be said for the Apple Watch’s UI. The main screen consists of tiny bubbles representing each application that you have to swipe and navigate. They aren’t arranged in a regular pattern and are obviously tiny thus proving challenging to find what you’re looking for. You can use the Digital Crown (more on this below) to zoom in though. By the way, pressing the Digital Crown takes you to the home screen. Swiping up takes you to “Glances” where you can swipe through screens to view things like the weather, calendar appointments, battery life, music controls etc. Notifications on your iPhone show up on the display and notify you with a slight vibration. They are text based and just have the particular application’s logo on the top left. Swiping down from the top shows you your notifications in a similar form. Apple does not deal with notification that well on iOS so it will be interesting to see if they can make notifications a thing with their new wearable. The user interface looks pretty as with all Apple products and looks to work relatively smoothly although I have seen units jitter and stutter on more than one occasion while people demonstrated them on YouTube. It should however be noted that those were demo units and do not necessarily reflect how the final consumer product will behave. Battery life earned its own title in this article namely because it has been seen to be one of if not the most important factor for smartwatch consumers. Apple claim the Apple Watch will last 18 hours on a “typical day”. They also happen to claim their iPhone last the whole day but anybody who owns one will probably tell you otherwise. When it comes to quoting battery life on mobile devices, I personally do not trust Apple. Nevertheless, I have not tested this for myself hence it is unfair to make any judgements as of now. What I should mention though is that Apple has already lost to its competition when concerning battery life, the Pebble lasts 7 days whilst most Android Wear devices and Samsung Gear products last up to 2 days on a single charge. As is typical of Apple, their charging technology is proprietary. The Apple Watch charges using a clever inductive magsafe charger that simply snaps onto the back of the device. Since the Apple Watch has been made by Apple, the company had to show you how their product is “revolutionary” and “unique” among others. As we mentioned before, the watches share some characteristics with some Samsung devices from the past and the most notable of those comes in the form of gimmicks. 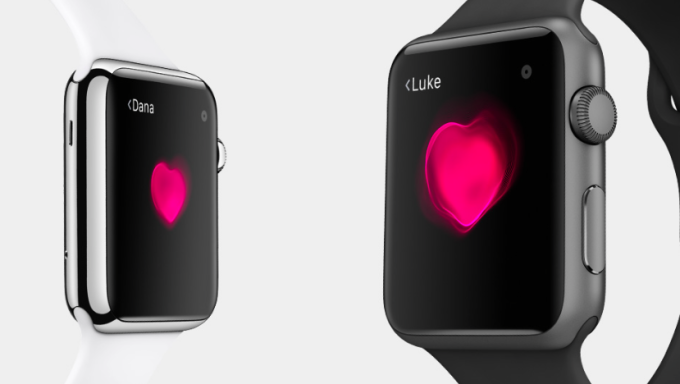 The first is the ability to share your heart beat with other Apple Watch users. This can either be extremely creepy or just one of those features you try to show off at a party. Next, you can draw on the device and it will appear on your friend’s device just the way you drew it. I think we all know people will be more busy drawing watermelons and cucumbers rather than pretty little flowers or smiley faces. As far as we know, there is no way to block these which could put you in an embarrassing situation if you’re at a meeting and suddenly certain things pop up on your wrist, “just they way you drew it”. All is not gimmicky though, we do have something truly unique and cool in the form of the Digital Crown. The Digital Crown is like an ordinary watch’s crown but you can rotate it and tap it to do certain things. The main objective is to make scrolling easier and making pinch to zoom redundant on the tiny display. Tapping it takes you to your home screen. Apple also introduce what they are calling “Force Touch” which basically allows you to tap the screen a bit harder than usual to execute a different function. At the end of the event, what we got to take away was the pricing. The Apple Watch seems to be a good product from Cupertino but the outlandish pricing structure will certainly drive away a good amount of consumers. Aside from Apple Pay, the functions of the device are identical to that of most of its competitors which therefore presents the question that has been plaguing smartwatches for a very long time – when you have a smartphone, why buy a smartwatch. Apple has strongly attempted to gear this to the fashion crowd, going so far as to make a model out of gold for the ultra luxury buyer. Having said that, it is also very clear that the products do not even stand on the same level as big name watch brands like Omega, Rolex, Rado etc where hand made Swiss clockwork mechanisms and a wider variety of premium designs and material choices signify opulence. What is most concerning about these new smartwatches is the fact that unlike the offerings from watchmakers mentioned above, these are all electronic products. That means by this time next year, Apple will probably have a new and improved product. When it comes to real watches, they are referred to as timeless as they never get outdated or old but when you have last year’s gadget, it is of little interest compared to the fresh new release. The Apple Watch pre orders will open on April 10th and prospective consumers can go to their nearby Apple Stores to see the product. The devices will ship starting April 24th and will be available in Australia, Canada, China, France, Germany, Hong Kong, Japan, UK and the USA. The Apple Watches are only compatible with the iPhone 5, 5C, 5S, 6 or 6 Plus. Do you think they have “revolutionised the smartwatch” or created an expensive toy that will get outdated pretty soon? Please share your thoughts and views in the comments section and stay tuned to Techetron for more content like this.